If you’re looking to run a web store based on WordPress, you’ve probably come across the name WooCommerce many times. WooCommerce is considered to be one of the best WordPress shopping cart plugins, if not the best. It combines a whole range of built-in features with the ability to use many useful extensions. Starting your first web store with WooCommerce is relatively easy to do, and in this article I will show you what you need to get up and running. It’s developed by one of the largest WordPress theme shops around, WooThemes. They make sure they deliver a top-notch product and they don’t charge a penny for it. It works very intuitively, you hardly need any instructions to get it working. Its default features are good enough to start your store, but they also offer some excellent paid extensions (as do hundreds of independent developers). Many WordPress theme developers are also making WooCommerce optimized themes so you can make the most of your store. You don’t even need to have your own inventory (for example my own shop is running fully on movies sold and delivered by Amazon). WooCommerce is the only WordPress web store plugin which has its own mobile app to manage the store. What Is Needed to Get Started with WooCommerce? There are a number of things that are required to set up your WooCommerce store. Please note, even though the WooCommerce plugin itself is free, some of these items below aren’t. A domain name and hosting are mandatory and will always cost you money. You can get themes and plugins for free though, and it’s possible to have shipping and payment gateways priced per transaction without a monthly fee. Realistically, you are looking at spending a few hundred dollars if you want a professional theme and some paid plugins, with some of these costs recurring each year. Having said that, you can have your store running for under $100 a year for something simple. Hosting: Nothing is more important than quality hosting. WordPress + WooCommerce: Seems obvious, but some people don’t even know WooCommerce is a WordPress plugin. Theme: WooCommerce comes with a decent theme already, but there are hundreds of beautifully designed WooCommerce themes out there. Payment Gateway: Very important to collect earnings, payment gateways connect your store to payment providers. Shipping: (Optional) If you are selling physical products you may want to connect your store to one or more shipping companies and use their actual rates. Security: (Optional) Since you are selling things and storing customer data, there are a few security steps you need to look after. You might notice that I didn’t include plugins as an item in this list. That’s because a plugin isn’t a requirement on its own. A plugin is just a way of adding functionality like a payment gateway to your store. WooCommerce has some pretty convenient integrations already built in, so in some cases you don’t even need a plugin. Lets go through these items above more thoroughly to see what they really do for your online store. While there are no really bad large hosting companies anymore, hosting isn’t always hosting when it comes to WordPress. I am a firm believer of using WordPress optimized hosting but many would disagree with me and call it a brainwave from the marketing department. What matters is the loading speed of your site along with its uptime. Both items are equally important and you really don’t want to be cheap on this one. Nothing is more annoying than a slow loading site or one that is constantly down. You might come across the term caching now and then. Simply put this is a way of speeding up your site by turning your dynamic site into a static version which loads faster. But web stores can’t be fully cached due to their dynamic nature. The shopping cart is a good example. This section will always remain dynamic since each customer and its order are different. So don’t let caching disillusion you in your search for a proper WordPress hosting company and always read their reviews. I did a series of articles about WordPress hosting here on SitePoint.com which you might want to read. I will keep this one short, since it speaks for itself. All you need to do is install WordPress itself, then add the WooCommerce plugin. Please note, that you can’t use WordPress.com for WooCommerce. You can find out more about the differences between WordPress.com and WordPress.org here. WooCommerce works with any theme, but you may want to consider a WooCommerce optimized theme. The main reason for this is that there’s a huge difference between a blog theme and an e-commerce theme. This can be small things like having a shopping cart order total in the menu bar, to the way suggested sales are presented. WooCommerce comes with its own set of functions, which are best used by WooCommerce optimized themes. Picking a good theme will take you several hours or even days. The reason for this is that while you can optimize your theme, you don’t really want to have to switch after a few months. Most themes come with specific settings which will only work on that theme, which means you may need to rebuild your site (sometimes up to product level) if you choose to switch themes. Furthermore, you can confuse your returning visitors when you switch themes too often. Try to stick to a new theme for at least 2 – 3 years. A payment gateway is used to integrate one or more payment providers into your store. WooCommerce comes with PayPal already integrated, you only need to fill in your PayPal account details. They also have their Mijireh integration, which connects you to over 90 payment gateways in 69 countries. Mijireh serves as a (paid) gateway between your site and the actual payment provider, so it isn’t a payment provider itself. It does make it much easier to fully integrate these providers in your store by providing the necessary infrastructure and taking care of security concerns (since you will be working with credit card information). If you don’t want to use Mijireh or PayPal, WooThemes has a whole range of payment gateway plugins for you to choose from. These are mostly paid plugins, and some have additional requirements like an SSL certificate. It does offer you full control over your payment process and could be cheaper than using Mijireh if you only use one or two payment providers. 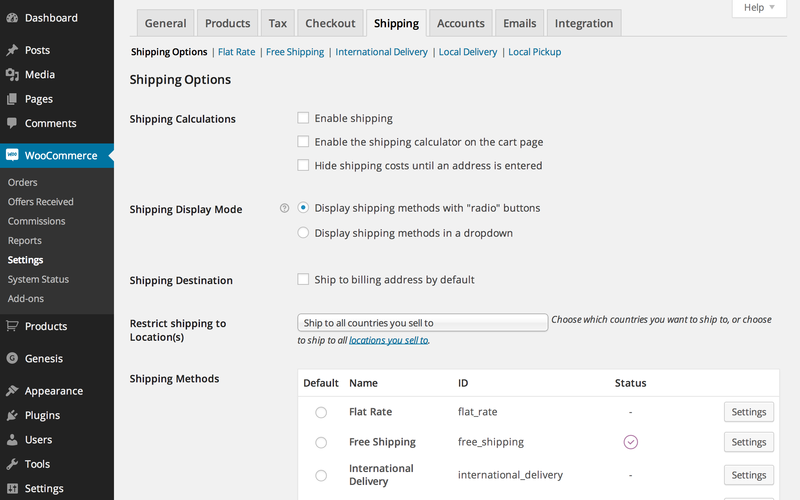 WooCommerce has various shipping options built in like flat rate, international or free shipping. But all of these methods require manual tasks to be performed. Unless you are offering free shipping (which can also be from a certain amount ordered), you need to specify shipping rates. This is where it gets tricky since there are several large shipping companies with hundreds of different rates based on a user’s location and package size. There are plugins available for all of the major shipping companies. This way a customer can see the actual shipping rate in their ordering screen. These plugins are paid, but they will definitely save you time when you are getting several orders per day. You could also decide to outsource your fulfillment process. You can export your orders to your fulfillment providers who send your product, without you even needing to lifting a finger. You have to do a Google search for this though (hint: WooCommerce fulfillment) since there are currently no providers listed in the extensions section on WooThemes.com. Running a web store means you need to think about website security. While this sounds scary, it isn’t that bad if you are not storing any credit card data. And trust me, you don’t want to do that if you are just starting out. Storing credit card data means becoming PCI-DSS compliant, which is a whole different adventure. Luckily requirements are less strict when you use a payment gateway like Mijireh which I mentioned above, since they take care of the necessary security measures (they are the ones that are PCI compliant). You don’t actually need any extra security other than what your hosting company provides. You may wish to consider a SSL certificate (which gives you the ‘https’ in front of your domain) if you are serious about your business and security. This certificate allows for extra protection when data is sent between you and your customer. While an SSL certificate isn’t required, it certainly does increase the trust a visitor might have when purchasing from your store. This added trust is worth the price of a certificate alone, with the price usually under $100 per year. WooCommerce is an excellent shopping cart plugin for almost any WordPress store. Because of it’s intuitive interface it’s particularly good for those starting out with their first web store. This doesn’t mean you need to switch systems when your store gains popularity. By using a professional theme and some clever plugins you’re well on your way to running a professional and highly visited web store with basically no limits.